My wife and I wouldn't hesitate in recommending Martin and Dan Richmond (M Richmond and Son Building and Carpentry Contractors) to anyone looking for reliable, professional and highly skilled builders. Its fair to say it was a massive decision deciding who to work with on our build/renovation. From the start Martin and Dan were consultative and accommodating, happy to answer any questions and provide expert advice when needed. They were highly recommended to us by a number of independent people and their quote was very competitive. Their workmanship is excellent, they clearly are very passionate about what they do and it comes across in the finished product which looks brilliant and to such a high standard. The build lasted around 6 months and the house went from cira 1100 sq ft to 2650 sqft. They are have done all the interior fit our work including the kitchen and bathrooms. What they have done in the time period is quite remarkable. Everyone of Martin and Dan’s team are brilliant and the comments below stand for everyone at Martin Richmond and Sons. They are extremely honest and trustworthy (always had our interests at heart), reliable (always on time and here every single day of the build), polite (both to us and our neighbours), tidy (clearing the pavement/road when needed, the site looked immaculate most of the time which is amazing considering the work and materials involved) and professional. If we were doing this again in the future we wouldn't consider using anyone other than Martin and Dan. They have forever made a massive positive difference to our lives, building a family home we can raise a family in. 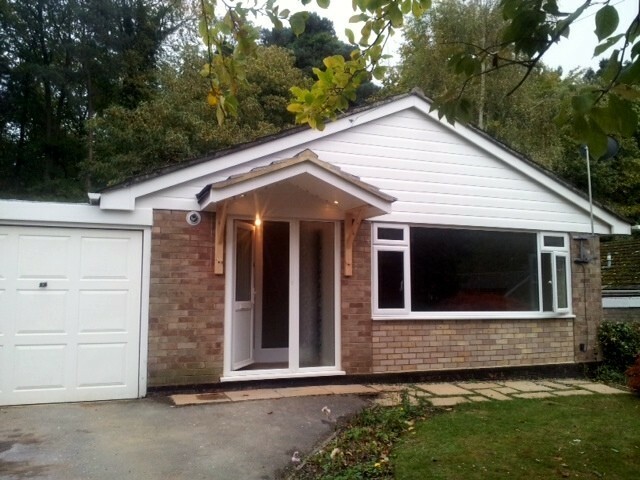 After downsizing to our present property we set out to convert the garage, refit and extend the kitchen, install a downstairs WC, utility room and storage. Richmond & Son was recommended to us by a friend who worked in the trade. My first contact was by way of a phone call to Martin Richmond, who explained they did all types of building work and would be pleased to discuss the work in full after planning and building Regs had been rubber stamped. This attitude was a refreshing change as my other enquiries via various other channels had not produced anything. After planning/building Reg approval Martin & Dan Richmond arranged a joint visit to check the run of the drains, power points, plus take various measurements. Suggestions were also made as to where we might like to consider sourcing the kitchen and appliances along with a host of other products we also required for other projects we were doing at weekends. A start date was agreed provisionally subject to their current job finishing on time which was governed by the weather. Work started on time. Both my wife and I were impressed by the firm's work ethos and undoubted knowledge. Time keeping was excellent with the work being done to exacting standards. All questions were answered in full. There was always time to explain anything I wanted clarifying. One of the benefits of dealing with a local family building firm is that they have a proven track record over a myriad of various builds in the immediate area; meaning they don't often come up against situations they haven't encountered before. Certainly our build meant, through no fault of Richmond Builders, there was a series of changes plus revisiting sizes and measurements which were dealt with very promptly. Having both Directors Martin and Dan on site meant any supplier or variation to delivery schedules could be done by a quick phone call. 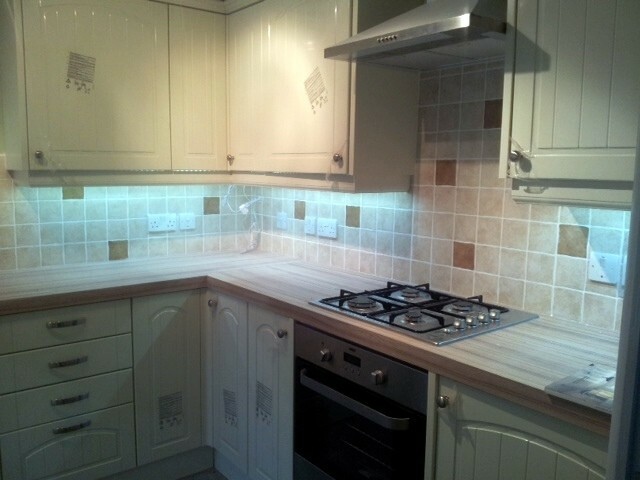 A typical example was when the kitchen plans had to be modified at short notice. Dan undertook the all the adjustments to the original layout and re-jigging some of the fittings. This was done directly with the supplier and resolved the next day. The most impressive instance of thinking on their feet was when, unexpectedly, while working on the front of the garage roof, our existing porch started to become unsafe; the response was instant and everyone assisted in the dismantling. It transpired the metal pole which was on the left hand side of the porch was load bearing, supporting a 4 inch square piece of plywood. Everyone had input into the best way forward. Within ½ an hour all measurements had been taken and checked, materials ordered while Dan had driven off site to source the timber, then started to produce the bespoke support bracket. The price charged for this and other expected work was both fair and reasonable. I would certainly recommend this firm for good workmanship and ethical practice. Being a member of the Guild of Master Builders adds a further layer of confidence. Before our main building work started I asked Dan to fit our new doors. 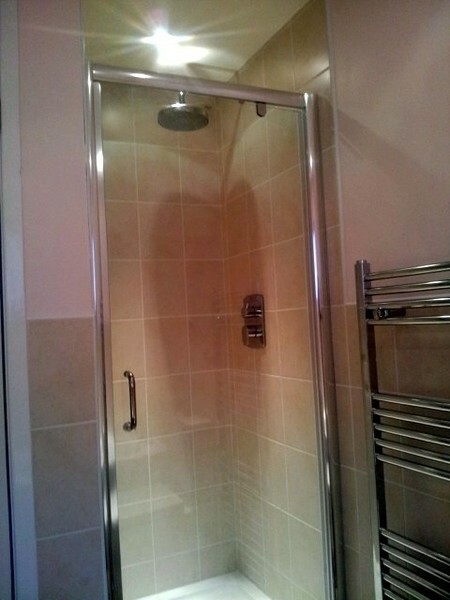 Dan sourced, supplied our choice of doors and fittings from his supplier then delivered them. Dan, without doubt, is a highly skilled carpenter. While impressing both my wife and I with his kitchen fitting and other varied work which ranged from standard to extremely challenging, being both professional and pro-active, full of suggestions and ideas, being capable of delivering a very high standard of work within a tight timescale. "I asked Dan Richmond to make a glass-fronted cabinet for my wife's doll collection. He had not done anything quite like this before but had the ideas and skills to produce a very worth while piece of work at a reasonable price - see photos. I would certainly recommend him as a very competent carpenter." Dan, Martin and the team recently completed the renovation of the entire ground floor of our property including the removal of a load bearing wall and fitting a new kitchen. We are genuinely thrilled with the results and we were thoroughly impressed with the quality of workmanship and attention to detail. Dan has a real 'can do' attitude which is really refreshing and nothing is too much trouble. He went out of his way to make sure we were happy with everything and put himself out on many occasions, working weekends were necessary. He gave us practical and cost effective advice and guidance and he kept us informed and updated at all times. M Richmond & Son are, in our experience, competitive, reliable and honest tradesmen and we would not hesitate to recommend them or use them again in the future. Indeed we feel very lucky to have found them! 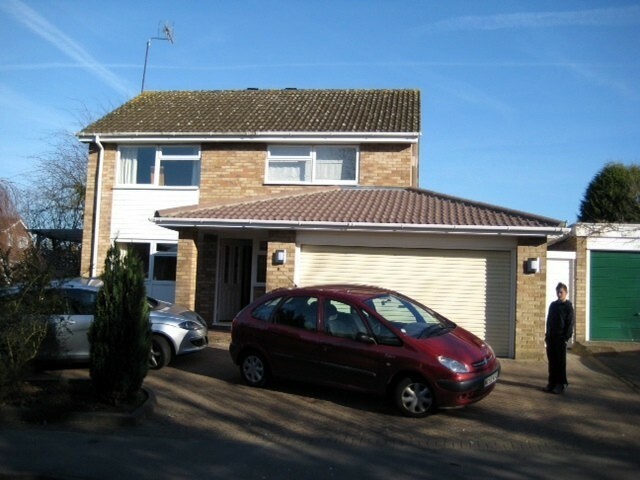 From pricing to completion our extension was made as easy as possible for us. We were kept fully informed with developments and offered excellent advice on internal fittings and accessories. The build was completed on schedule and all the guys were always extremely considerate of our young family, which was very important to us. Martin never failed to be on site at 08.00 and work was even completed at weekends when convenient. Any disruption to us was kept to a minimum and I would have no hesitation in recommending Martin to anyone. Once the build was complete we obviously needed assurances that somebody would be there to help with any situations that arose - there were very few but when required these were attended to immediately and fully resolved. For an investment that is extremely personal, generally expensive and stressful I can only state that our 5 month build really was trouble free and the end result has completely transformed our home. M. Richmond and Son to all who ask. I hired M Richmond and Son to take out my 70's downstairs cloakroom. The stripped it back to the bricks, made good and re plastered prior to fitting a new toilet and basin as well as a laminate floor. Really good workers and very reasonably priced. It was nice to have someone who could supply all of the elements of the job without having to employ several tradesman - excellent work. They came really quickly and completed the job in a really short time frame. They were both professional and approachable and nothing was too much trouble.